USAP is the highest quality, single-specialty, anesthesia practice in the country. We’re owned and clinically governed by practicing physicians, including some of the world’s foremost experts in anesthesia. 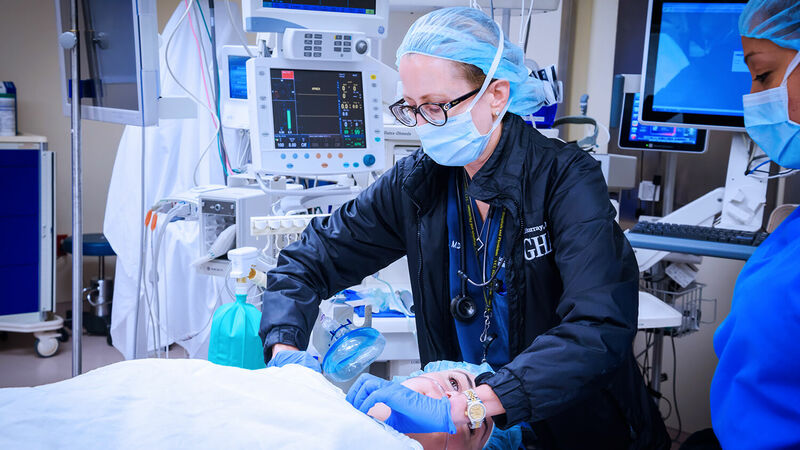 Our anesthesiologists, CRNAs, CAAs, and all members of our care teams share operational and clinical best practices organization-wide, helping to facilitate the delivery of consistent, high-quality services for patients, surgeons, facilities, and payers. At USAP, clinical excellence is supported by a world-class business leadership team. Our capital partners are Welsh, Carson, Anderson & Stowe; Berkshire Partners; and GIC. All three are investment firms with significant experience investing in and building leading healthcare companies. Together, we’re changing the way perioperative services are delivered. USAP was founded in 2012 to provide leading, high-quality groups of anesthesiologists with a strategic partner that allows anesthesia providers to focus on what they do best—create positive patient outcomes. Our visionary leaders created an exciting new approach to anesthesia care, building on our rich history, collective expertise, high-quality practices and innovative processes to meet the challenges of a changing healthcare industry, provide exceptional patient experiences and deliver excellent clinical outcomes. USAP’s collective depth and breadth of our anesthesia expertise and resources are unrivaled in our industry, thanks to our team member's commitment to high-quality anesthesia patient care and strong leaders who provide oversight within every local physician group and clinical quality committees, both locally and nationally. USAP’s unique, single-specialty partnership model creates an organization in which each and every partner is invested in our success. We’re blending our high-performing, forward-thinking cultures to build an entity that is better, stronger and more innovative than we could be alone. We’re passionate about collaborating and discovering trends by applying the latest medical research to our practice through our IT tools, quality measurement capabilities and utilization of patient data. The formerly named Greater Houston Anesthesiology (GHA) has been providing leading perioperative and anesthesiology services for the foremost medical facilities in the greater Houston area since 1996. The group’s providers perform more than 200,000 anesthetics annually in all areas of anesthesiology. The practice previously known as Pinnacle Anesthesia is recognized as the anesthesia leader in the Dallas/Ft. Worth area and one of the nation’s highest quality anesthesia groups. The group’s providers practice at more than 100 facilities in North Texas and have a reputation for rigorous quality assurance and peer review process. Known for clinical excellence and strong hospital relationships, USAP-Florida is made up of high-quality anesthesiologists and anesthetists trained at some of the best hospitals in the United States. The group provides anesthesia care throughout Florida. Composed of the former Greater Colorado Anesthesia and South Denver Anesthesiologists practices, this group’s high-caliber teams provide the highest level of patient care and personalized service at more than dozens of hospitals and surgical facilities throughout the Rocky Mountain region. Formerly named Anesthesia Consultants Inc. (ACI), this practice has been providing quality anesthesia care for decades. Covering the anesthesia needs of many types of routine and specialty surgical procedures, USAP-Nevada provides care at more than 35 Nevada hospitals and health facilities. The formerly named Physicians Anesthesia Service (PAS) has been providing quality anesthesia services to the Seattle community for more than 40 years. The group’s approximately 120 anesthesia professionals provide anesthesia service ranging from care of the most medically complex inpatient to outpatients in ambulatory facilities.